Way of the Roses — Loving the Route in the Rain? Loving the Route in the Rain? I just wanted to say how brilliant the Way of the Roses cycle route is. There were barely any busy roads to cycle along. In fact we barely saw anyone on our 3 day trip; it may have been the incessant and often torrential rain that put them off! 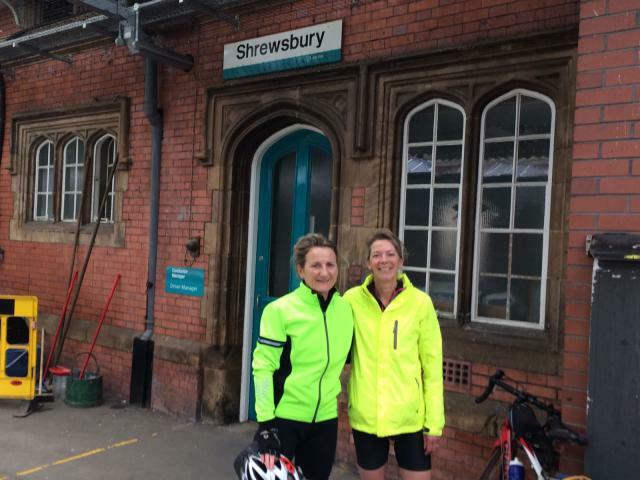 My friend and I left Shrewsbury on Monday 15th May. After a little problem with our bike booking on the Virgin train section (the lady on the phone must have misheard the date and booked the bikes on 5th May instead of 15th) so we were kicked off the train 30mins into the journey when 4 cyclists who had booked the correct train joined the train. However, the Virgin staff at Warrington were really helpful and booked us on the next train. We arrived mid-afternoon in Morecambe to heavy rain. There was a small signage issue near Morrisons in Morecambe (I think the sign had been turned). However thereafter as long as you keep your eyes peeled the signage is very good. Due to the great write ups about the evening meal we chose to stay the night in Airton in the Lyndon Guest House (6 miles before Cracoe). Riina and Ian were so welcoming. Although they don’t have somewhere to store bikes they were happy for our very wet bikes to be brought into the house. They also dried our kit and offered to wash them too. The 2 course evening meal £15.95 pp was absolutely delicious, fresh with loads of vegetables. The twin room with ensuite we were in was quite small but had everything one would need. Lots of rain the next day but the scenery was spectacular in spite of the rain. Our second night we stayed with friends in York. It was dry for 2 hours when we left York but then the heavens truly opened and we were drenched from above and below from the surface water. The last 43 miles were dire; we were so very cold by the time we arrived in Bridlington that all we managed was a quick photo by the sign and then straight to Tescos’ toilets to dry off and change (FYI Tescos is right next to the station). Such a shame that we didn’t see the route in the best conditions but we would both recommend it.